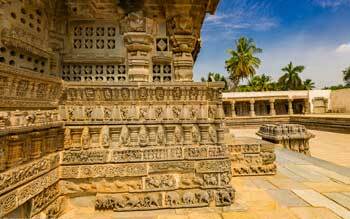 The superlative Hoysala Architectural style of building blessed the South Indian states with many enticing temples. Chennakesava Temple at the historically significant town of Somanathapura in Karnataka is one of the finest examples of this style. Built under the directions of a commander serving the Hoysala Empire during 13th century, the temple is built on a raised platform and has many highlights like super-towers, decorated pillars and adorned ceilings. The temple has captivating sculptures that depict dancers, musicians, chariots, horses and camels. Dedicated to three different forms of Lord Vishnu, the temple has three shrines with impressively decorated walls. Another significant feature of the temple’s architecture is that it has two parallel eaves running around it. These constructions are decorated with depictions from the great Indian epics like Mahabharata and Ramayana. Spend quality time exploring this beautiful temple and attain a great peace of mind.